Steve Olney VK2XV is the creator and administrator of the Neutron Star Group website which collects a listing of confirmed amateur attempts at pulsar detection, many of which have been made with a humble RTL-SDR dongle. A pulsar is a rotating neutron star that emits a beam of electromagnetic radiation. If this beam points towards the earth, it can then be observed with a large dish antenna and a radio, like the RTL-SDR. Now after more than four years of trying, Steve has finally been able make his own confirmed pulsar detection by using a 42-elment circularly polarized Yagi antenna tuned for 436 MHz and an RTL-SDR. Typically a large dish antenna is used to receive a pulsar, but Steve has instead used a fixed position circularly polarized Yagi antenna, which he writes has an equivalent aperture to a 2.8 meter diameter dish. His antenna can point directly upwards as his target is the Vela pulsar which happens to pass almost directly overhead at his location. 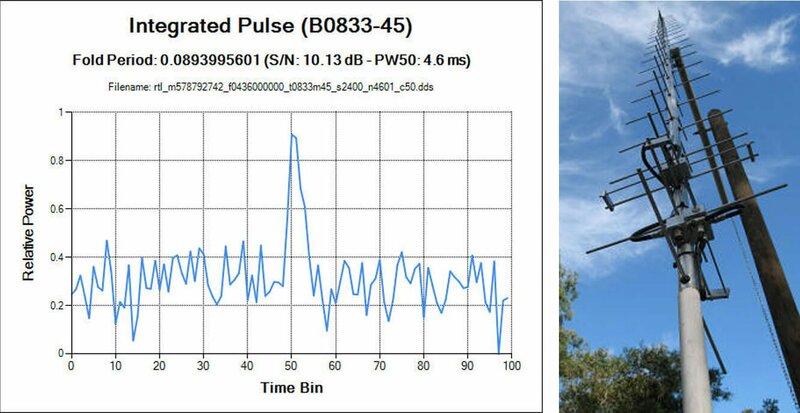 Detection of a pulsar involves determining its rotational period from the regular wideband noise pulses that they produce. Pulsar detections with large aperture dish antennas can easily be confirmed due to high SNR, but smaller weaker detectors require some use of some mathematical techniques to confirm a positive detection. This is especially important as it’s possible for terrestrial signals to mimic a pulsar. In order to detect and confirm the pulsar detection from a weak signal, Steve uses a technique called epoch folding, which makes use of the fact that the period of pulsar pulses are extremely regular. To verify the results he also makes use of techniques such as folding at the predicted period, de-dispersion and plotting daily results against the predicted results. These techniques are explained in more depth in his results post. Interesting. With all that money and effort I wonder why he went with the cheapest dongle possible. Hi Jeff. The reason I used that dongle was that it was easy to write my own code for it (or rather modify others’ code). I am sure it could be done with others – but I found the information for this dongle easy to follow. Also what is perhaps not understood is that for radio astronomy applications 8-bits is fine (professional radio astronomers use 1, 2 or 3 bits). For the 432 MHz band there is also a limit of usable bandwidth before running into RFI (I found a 2.4 MHz spot relatively clear centered on 436 MHz), so the 2.4 MHz bandwidth of the dongle is fine also. If I was observing at 1400 MHz (where there is less RFI) I would consider looking at SDRs with wider bandwidths. modulationI thought the project was fascinating. I’ve heard it said that astronomy is one of the few remaining fields where citizen scientists can still make useful observations and contributions. Hi Dave – the attraction of Vela is that it ‘glitches’ roughly every three years (a ‘glitch’ is where it suddenly spins-up and then slowly returns to its normal spin frequency slowdown). Some of the glitches are up to 3 ppm. My observation frequency measurement error is about +/- 0.5 ppm, so there is a possibility that I might be able to see a glitch in my data. The real prize for this would be to be the first to notice it – but this is unlikely as there are two professional observatories monitoring Vela each day (up to 18 hours a day) which have automatic alarms (sends emails) to alert them. I only observe 2 hours a day, so most likely I will see a glitch as a jump between two days and so be a bit too late. Okay, that’s news to me, that a pulsar can glitch like that. Now I’m starting to want to try to detect them. Vela would be tough though, I’m at 43 degrees north latitude. You mentioned in your article that you used a circular polarized antenna to prevent cross-polarization loss. Does Vela (or any other pulsars) have a consistent polarization? I’m wondering if a linearly polarized antenna could be rotated to match the incoming signal by a tracking system. It could also extend the available observation time. Hi Dave – all pulsars are different. Vela is almost 100% linearly polarised. Due to the fact that the angle of the polarisation swings almost 90 degrees during the pulse on time (about 2 ms for Vela) it is not feasible to track it. The CP approach is one solution – it has been argued that it is not a good solution – but it works for me. In the northern hemisphere the pulsar to go for is B0329+54. It is largely unpolarised so the question of type of antenna (CP or Linear) is largely irrelevant. It makes sense that Vela’s polarization would rotate that fast, since the pulsar itself is spinning so quickly. An antenna trying to keep up with that would look like a blender. Thank you for the links, and for the suggested target! This is fantastic work! I’ve been considering to attempt to try detecting pulsars using commercial products but I think I will just take advantage of my universities’ radio equipment. We have the National Weather Service on campus so they probably have way better radio dishes than I could ever build. No glitch yet – but one should happen in the next 12 months. Good luck with your pulsar hunting !! !